I’m not much of a Chick Lit reader, but I liked this book a lot! …At first, I had a bit of a hard time getting into the swing of the book, but after a while, I had a hard time putting it down. I associated with the main character, Julie quite a lot. Feeling like her life took the wrong turn, and trying to find exactly what makes her happy. It’s kind of where I am now, so I really was interested on how the story played out. The characters are fun and evolve nicely. It was a tad bit wordy at times which I ended up speed-reading through. There are ups & downs, and surprising turns just like in real life. At one point, I couldn’t believe the way the author took the story, but at the end it really worked out well. A good read. I need to read more by Anthea. Julie has had enough! At 27, she feels overwhelmed with the ”shoulds” her family pile on her, and an office job that she detests. It doesn’t help that she’s carrying her “baggage of unfinished business” with her, weighing her down even more… making it impossible to see clearly and dig herself out of the rut her life has become. When she finally decides to take action, a chance encounter presents her with an opportunity to deal with her messy past, so she sets off to Paris to find the answers that can set her free, and live a life full of meaning and passion. Julie loses herself in the sights and smells, and in the beauty of travelling in one of the most romantic cities in the world. She opens her heart to love, and begins to be true to herself… until she discovers a secret that sets her right back to where she began; uncertain about life — about love! When Julie arrives back home to Sydney, she needs to make some serious decisions, or risk missing out on true love… and finally having the career she always wanted. Join Julie and her delightful and witty friends on a journey of fun, adventure, and passion. 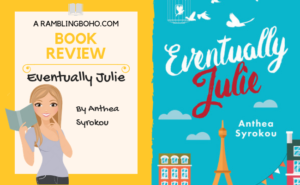 Set in and around Sydney, as well as London and Paris, Eventually Julie is a “finding yourself” romance that deals with being stuck in a rut and eventually finding the right ingredients to live a life that is true.